सम्मेलन का मुख्य उद्देश्य भारत के विभिन्न क्षेत्रों, एवं अन्य देशों के, जहाँ अहिंदी भाषियों को हिंदी पढ़ाई जाती है, शैक्षणिक विशेषज्ञों के बीच सम्बन्ध स्थापित करना है। इन देशों में संयुक्त राज्य अमेरिका, कनाडा, इंग्लैंड, मॉरीशस, फिजी, कैरिबियन आदि भी शामिल हैं जहाँ हिंदी विरासत भाषा और विदेशी भाषा के रूप में पढ़ाई जाती है. The conference aims to create a bridge between the pedagogical experts of the Hindi language taught to speakers of other languages (THSOL) in India and particularly in the non- Hindi speaking areas of India, and the pedagogical experts and instructors in the USA and the rest of the world, including the South Asian diaspora (Canada, England, Mauritius, Fiji, etc. ), where Hindi is mostly taught as a heritage language as well as a foreign language. "Teaching Hindi To Other Language Speakers (THSOL): Pedagogical Perspectives, Language Planning and Program Development". "Hindi to Speakers of Other Languages" is a term which applies to learners of Hindi as another language, regardless of whether the language is acquired with or without the exposure of the target environment. b) The learners from the heritage communities in the South Asian Diaspora whose family members speak Hindi or other Indian languages. c) The learners of the language who have not had any exposure to Hindi or other Indian languages and study the language outside the Hindi speaking environment. Submission of abstract does not guarantee acceptance. The Fourth International Hindi Conference is the result of a new initiative, introduced in the field of Hindi language education which aims to create a bridge between the pedagogical experts of the Hindi language taught as a second or foreign language in India and particularly in the non-Hindi speaking areas of India, and the pedagogical experts and instructors in the USA and the rest of the world, including the South Asian diaspora (Canada, England, Mauritius, Fiji, etc. ), where Hindi is taught as a heritage language as well as a foreign language internationally. 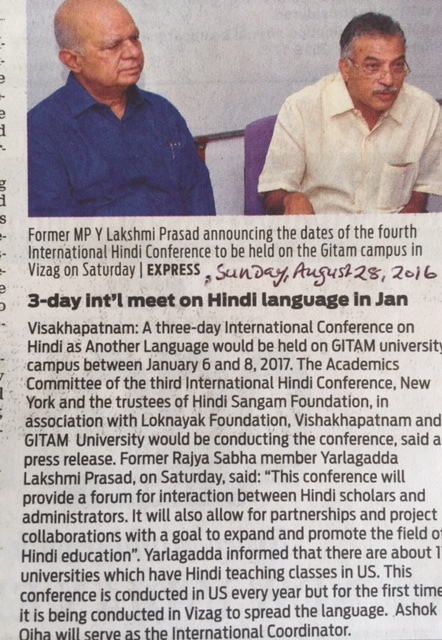 The President of GITAM University (http://www.gitam.edu/), and Padma Bhushan Dr. Laxmi Prasad Yarlagadda, Andhra University and President, Lok Nayak Foundation, have agreed to host the Fourth International Hindi Conference in Vishakhapatnam. It will provide a unique forum for a dialogue among Hindi scholars and administrators and will allow for partnerships and project collaborations to be formed with the goal to expand, enrich and promote further the field of Hindi education. This initiative has the active support of faculty from leading US Universities, such as New York University, Columbia University, Yale University, Syracuse University, City University of New York, Pennsylvania State University and others. This conference will not only further the field Hindi language teaching outside of the Hindi belt of India and in the diaspora, it will contribute to understanding wider questions of teaching and learning of language in complex socio-linguistic contexts. Scholars from: New York University, Columbia University, Yale, UPenn, University of North Carolina, UCLA, GITAM, Andhra University, Krukshetra University, Kumaon University, Uttarakhand Open University and others. All participants, speakers and invited guests are requested to register by November 30, 2016. (This amount is accepted as a donation to Hindi Sangam Foundation for the purpose of administrative expenses of the organization, which is a non-profit group based in USA and also in India. The Foundation has a mandate to carry out educational and academic activities to promote Hindi in the Indian Diaspora). Students who are not receiving grants: Free (must produce letter from their department head confirming they are not receiving any grant). (For participants from outside of India):US Dollars One Hundred (US $ 100 payable to Hindi Sangam Foundation, USA). Participants from outside of India may please mail your check to: Hindi Sangam Foundation, 4 Melville Road, Edison, NJ 08817, USA. Donation of (Rs. 2,500) Rupees two thousand five hundred by credit card using Make Payment link. in order to get exempted from paying the Suggested registration Donation. Your registration is complete after your payment is received. For sponsoring opportunities click here. Grand Sponsor: The Grand Sponsor contributes Rupees 1, 51, 000 and is entitled for: a special memento and honor at the conference events; publication of sponsors’ business/organization on conference banners, table space for presenting products and services and a one page sponsored content in the conference souvenir and the web site. Gold Sponsor: The Gold Sponsor contributes Rupees 1,01,000 (Rupees One Lakh and is entitled for: Table space for presenting products and services; receiving a plaque at the concluding event; One page sponsored content in the conference souvenir and the web site. Silver Sponsor: The Silver Sponsor contributes Rupees 51,000 and is entitled for: Certificate of Participation; One full page sponsored content in the conference souvenir and the on the web site. Advertisers: RATES (in Indian Rupees)-Full page (color): Rupees 51,000; Full page (black/white): Rupees 35000; Half page (color): Rupees 35,000; Half page (Black/white): Rupees 25,000.00; Quarter page (color): Rupees 15000; Quarter page (B&W): Rupees 10,000.